In recent times the Stafford Riverway Link has made significant progress in re-establishing the entrance of the navigation from the Staffs & Worcs. Canal near to St. Thomas Bridge No. 101. The Stafford Riverway Link is a Community Interest Company. The organisation has negotiated a 99 year lease with the owners of the land. This has enabled them to establish the position of the entrance basin and also to excavate the foundations of the former lock house. 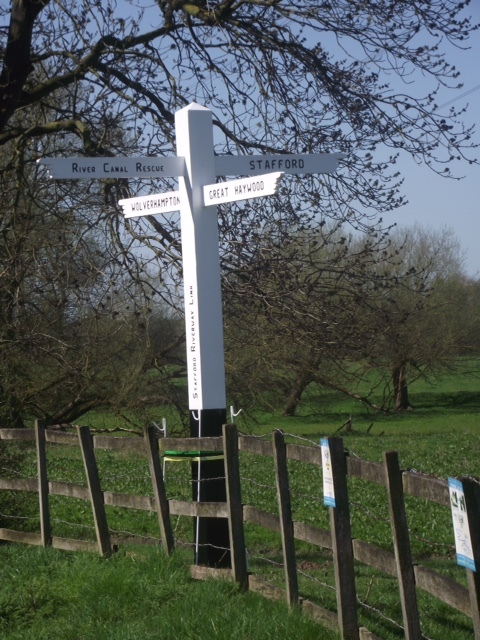 A significant event took place on the 18th April 2015 when a new fingerpost was installed and unveiled. The post was produced by John Mountfort and Alan Gosage in the workshops at Stafford Boat Club. It has been fashioned to the design of other Staffs. & Worcs. fingerposts. The ribbon on the post was cut by Olive Price, whose family were the last to occupy the Lock House. The post was financed by the ex-Mayor of Stafford's charity fund, with a further contribution from River Canal Rescue. The fingerpost has four arms. Two of them point to Great Haywood and Wolverhampton, and a third points to the location of the River & Canal Rescue. The fourth, the most important as far as the Trust is concerned, points towards Stafford. 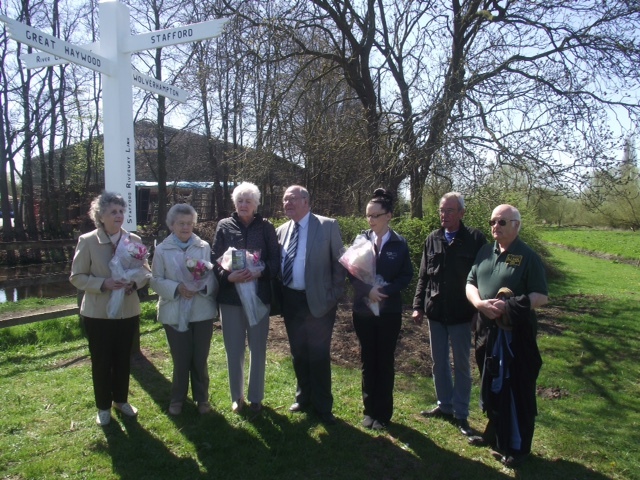 Pictured with the fingerpost are from left to right: Olive Price, her friend Peggy Payne, Lily & Brian Cross - former Mayoress and Mayor of Stafford, Sarah - representing Canal & River Rescue, John Mountfort - Commodore of Stafford Boat Club & Vice Chairman of S.R.L & Ivor Hind - Chairman of S.R.L.